UPDATED: Sat., July 14, 2018, 9:39 p.m. The work to renovate North Monroe isn’t just work. Consider it street archeology. Road crews working on the rebuild of North Monroe unearthed something last week that was both familiar yet strangely alien to modern eyes. It was a wooden pipe, circa 1890s. Technically, it was a wooden stave pipe, a type of pipe made with long wooden planks cut to join snugly and lashed together by coiled metal. It looks something like a long barrel, and was made using similar “cooper” barrel-making technology. Yes, underground pipes delivering water to houses and ferrying sewage out are quite common. Every house in Spokane has them. The city maintains about 1,000 miles of water mains, which are connected to 75,000 homes and businesses within its water service area. Though Schimmels has encountered wooden pipes before, and even has one on display in his yard, they are rare. If you’re lucky, someone like Megan Kennedy is around to take a photograph before that disintegration. Kennedy, an owner of Rogue Heart Media, runs the Meet on Monroe campaign, the North Monroe Business District’s effort to keep people coming to the area during the complete street rebuild. “We literally were walking down to Zip’s for our weekly supportive milkshake” when she came across the pipe, Kennedy said. She took a picture with her smartphone and the post spread quickly, garnering 350 “likes” and 260 shares. “It certainly got a lot of buzz on social media,” she said. Marlene Feist, director of strategic development for the city’s Public Works and Utilities Department, said the city’s streets crew was puzzled by the longevity of the pipe and couldn’t determine when it was last in use. A cast iron water main under the same stretch of Monroe is being replaced, and it was installed in the 1910s, presumably in place of its wooden cousin. Schimmels wouldn’t hazard a guess on the pipe’s exact age but said it’s as least as old as the houses around it. A brief survey of the county’s property data shows the age of homes gets close to what Feist estimated. Houses in the immediate region were largely built in the 1890s. Even then, Schimmels remains unimpressed. Dan Kegley, the city’s director of water and wastewater, said that wooden and cast iron pipes were used concurrently in the late 1800s, according to Feist. Wood was dominant until the 1880s, but the pipes were slowly replaced over time. 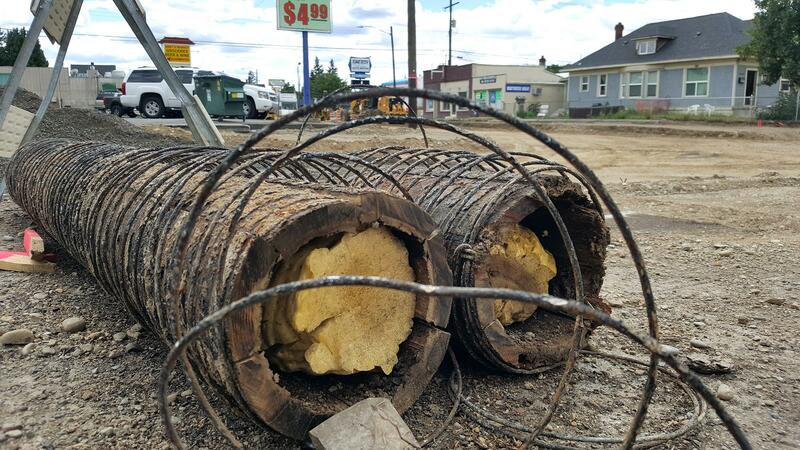 In the 1980s, the city found a wooden water pipe still being used downtown. Quite a find, but that’s not the strangest thing unearthed from below Spokane’s pavement. In June 2005, a road crew working on Division Street near its intersection with Third Avenue found human bones. A few days later, they found a coffin. At the time, local historians figured the bones dated to the 1880s, when the area was forested, and belonged either to the indigenous people of Spokane or to early white settlers. Following examinations by anthropologists and officials from the Washington state Office of Archaeology and Preservation, the remains and coffin were replaced where they were found and the site was added to a list of historic locations in Washington. Division traffic continues to rumble over them. Monroe’s wooden pipe will have no such reburial. Despite a groundswell of interest when the discovery and photo of the pipe were shared, Schimmels isn’t sure what happened to the pipe and didn’t really think it belonged in a museum. Kennedy, with Meet on Monroe, has a different take. Published: July 14, 2018, 5:08 p.m. Updated: July 14, 2018, 9:39 p.m.